Manufactured by world renowned optical technology experts Ciba Vision, Focus Dailies are hard-working lenses that support eye health through a range of sophisticated features. This family of contact lenses is amongst the top sellers in the UK and combine comfort and quality with durability and affordability. If you want a tried and tested lens that provides consistently sharp focus and breathability at an excellent price, Focus Dailies are a great place to start. Focus Dailies contact lenses are available for young and older wearers with differing vision and eye health issues. 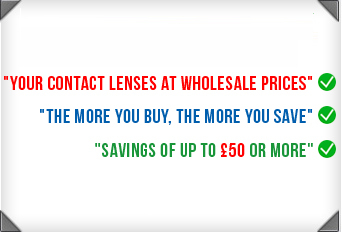 There are toric lenses specially designed to effectively combat astigmatism, progressive lenses that provide presbyopia sufferers with excellent vision at all distances, and standard lenses for younger long and short-sighted wearers. Choose between daily and monthly disposable contact lenses. Smart design and sophisticated technology make Focus Dailies ideal for the modern contact lens wearer. Ciba Vision aim to make products that suit the ever-changing needs of wearers and this family of lenses reflects that goal. Focus Dailies contact lenses have a particularly high water content, which makes them highly breathable. A higher water content means better breathability, as more oxygen can pass through to the eye. Meanwhile, a blink-activated moisture system in products such as Focus Dailies All Day Comfort allows eyes to stay naturally hydrated with every blink. This means freedom from dryness, slippage and blurred vision. All contact lenses in the Focus Dailies family are easy to handle and apply, making them ideal for first time wearers.